Close your eyes and think of the Alps. Now imagine a mountainous and snowy town full of little houses and excited skiers. Open your eyes. You are in Chamonix! This town is much more than just a ski destination – it’s one of the best regions in France. But this town is not only popular for skiers, but for all lovers of winter sports. To prove it, we leave you with a list of what to do in Chamonix. L’Aiguille du Midi is the highest peak in Chamonix, with an altitude of 3,842 meters. Malczewski, Balmat and five other guides, were the first ones to reach out the summit in 1818. Since then, it became a very touristic place. Whether you are an experienced climber or not, there are also cable cars. In addition, the highest vertical cable car in the world will take you from an altitude of 1,035 to 3842 meters above sea level. Argentière is a small and picturesque town. A glacier with the same name is located on the southeast of the town. It’s needlessly to say that this place is a popular destination for skiers, snowboarders and hikers due to its natural surroundings. However, if you don’t practice any winter sports, the village is worth visiting just because of its magical atmosphere. 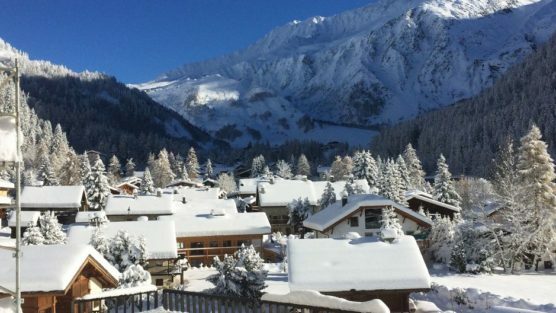 At 1,500 meters of height, located above the village of Les Houches, the Merlet park is the balcony of Mont Blanc, the place where you need to be. 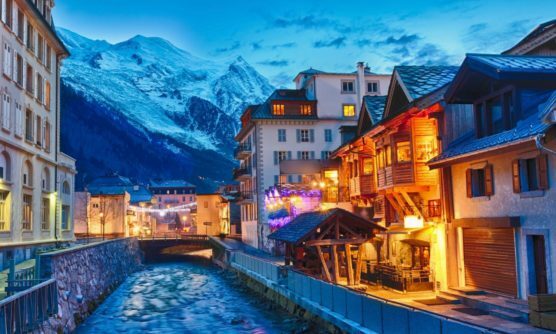 It’s known as the gem of the Chamonix valley. It’s an open “zoo” of 21 hectares of meadows and fir forests. 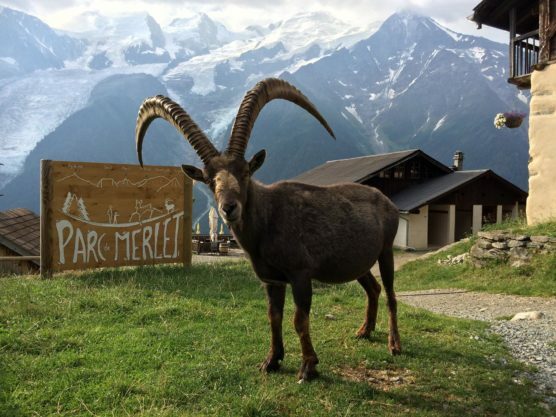 If you visit it, species such as the chamois, goats, deer, marmots are living in their natural habitat as well as many more animals that roam around this park in complete freedom. 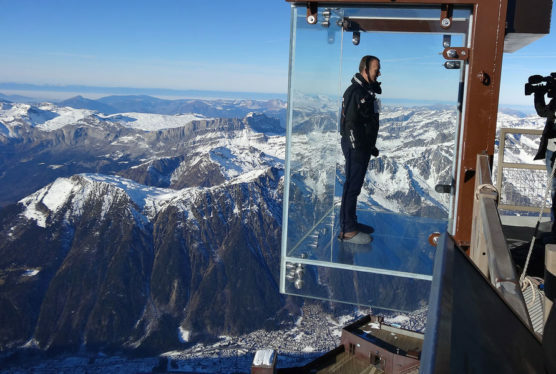 These are two impressive places, both situated on the top of L’Aiguille du Midi. Le 3842 is a café and restaurant where you can eat at 3842 meters above the sea level. On the other hand, the step to the void is a glass cube literally “hanging” in the space. Thanks to its 5 transparent walls, you can contemplate the breathtaking mountain views. Although, it’s not recommended to those who suffer from vertigo or have fear of heights. This experience reminds us of the Skywalk (the glass bridge of the Grand Canyon in the United States) or the viewpoint of the Toronto CN Tower (with a glass floor at 447 m height). This tram is perfect for those who want to enjoy the views in peace. On its way to the Bellevue plateau, you will pass through beautiful areas and you will stop at some of the stations. The tram, leaving from Le Fayet & Saint Gervais, can transfer you to the ski area of Les Houches – Saint Gervais. Those, who have experienced this little journey, describe it as a trip back in time through snow-covered forests. Mont Blanc is the highest peak in the Alps and the highest in Europe. 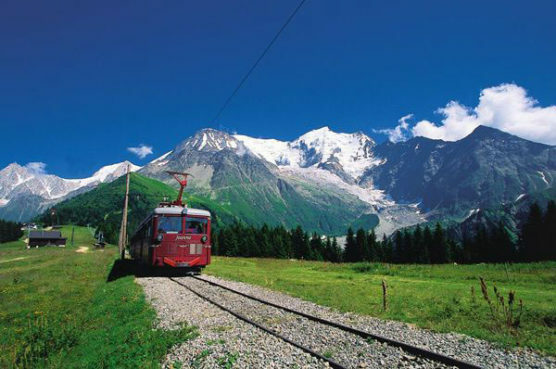 There are two things you can’t miss out if you come to Chamonix: get on the cable car and pass through the Mont Blanc tunnel. This Mont Blanc tunnel connects France and Italy by road. It’s also the deepest in the world (of those that still operate). It’s 11.6 km long and 8.6 m wide, and it took 8 years to build it up. 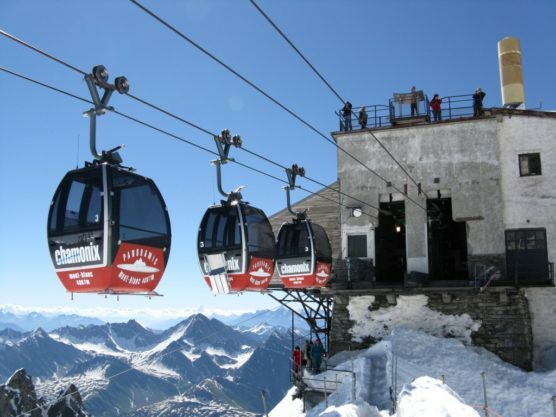 On the other hand, the Mont Blanc Panoramic Gondola (formerly/officially called the White Valley Gondola) operates an aerial route of 5,093 meters in half an hour and passes over the White Valley and the Glacier du Géant. 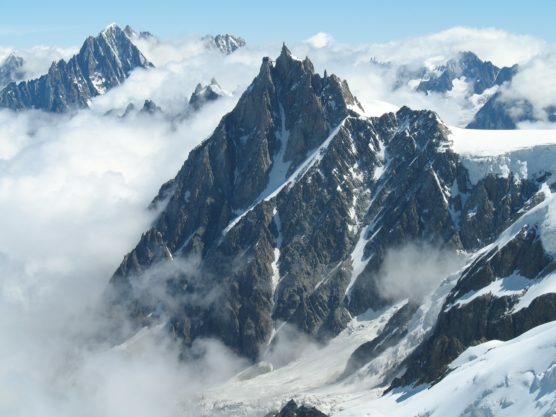 Join L’Aiguille du Midi with the Helbronner Point, which is on the border between France and Italy. The route is divided into 3 sections. You can see glaciers with their cracks, in addition to 360º beautiful views. Enjoying this experience is expensive, but very much worth it. It’s the largest family leisure center in the region, a good place to spend the day with children. Besides snow attractions, there are also trampolines, electric bikes and summer slides, among other facilities. 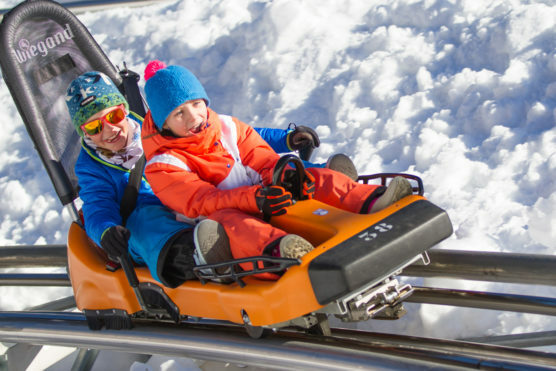 The most visited is the Alpine Coaster, a 1,300 meters long track with rails on which you can slide with a sleigh. 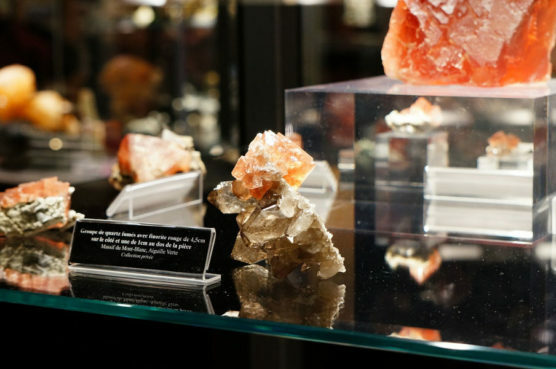 Here you can see the famous minerals of Mont-Blanc, among which are the smoky quartz and pink fluorite. Except for minerals, crystals and rocks, there is also an entertaining section dedicated to climbing and mountaineering. The young ones will enjoy the interactive climbing wall and the knot workshop. So that the trip to Chamonix-Mont-Blanc is fully complete, it only remains to choose the option of staying in a cosy chalet. You know which one do we mean? Those made out of wood, with fireplace and many sofas and cushions to relax in a cold evening while watching the snowfall through the window. 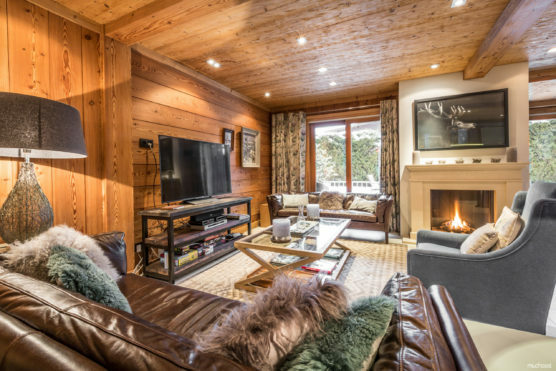 Here you can see some luxurious and cozy chalets in Chamonix. If you want to see more, have a look at our list of beautiful houses in snowy destinations. What do you think about our selection of what to do in Chamonix? Is there any other thing you like but we’ve forgotten on our list? Also, are you interested in learning more about the French Alps and their snowy destinations? Then don’t miss out our selection of the best ski destinations, you’ll love it!